The Secrets We Kept began as a short story. Here’s the background: The CIA, just a decade out of WWII and fresh into the Cold War, decided to use Boris Pasternak's novel Doctor Zhivago as a weapon. Zhivago's plot revolves around a love story between Lara Antipova and Yuri Zhivago. But its depictions of the October Revolution and the Russian Civil War, as well as its themes emphasizing the importance of individual freedom in the face of the USSR’s required collectivism resulted in Zhivago being deemed subversive by the State. 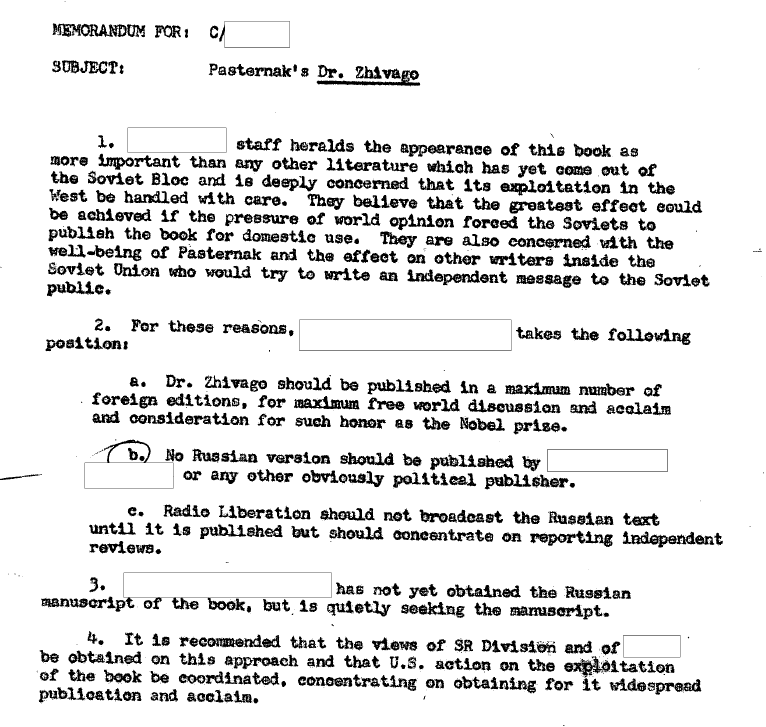 The CIA obtained the banned manuscript, clandestinely printed it, and smuggled it into the USSR. The journalists Peter Finn and Petra Couvée uncovered the details through petitioning the CIA to declassify documents related to its mission (codenamed AEDINOSAUR); it was seeing all the declassified documents—with their blacked-out and redacted names and details—that first inspired me to want to fill in the blanks with fiction. 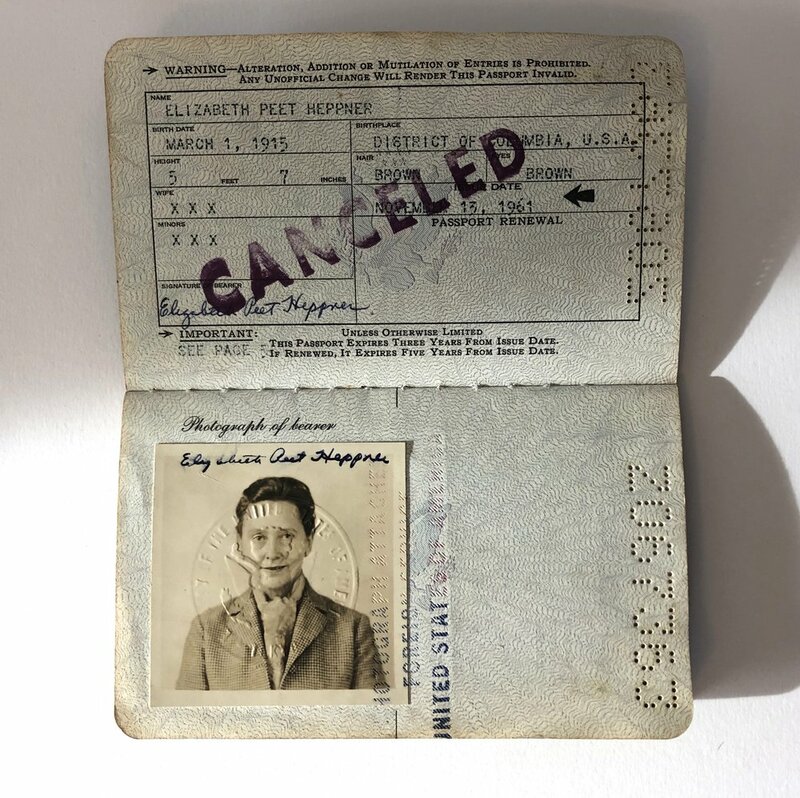 So, in Elizabeth McCracken's fiction workshop at the Michener Center for Writers, I wrote a story centered on a group of fictionalized (and mostly-unnamed) female CIA typists working on the Zhivago mission—my attempt to fill in those redacted blanks. Over the course of nearly three years, I expanded that story into The Secrets We Kept. And as I did so, I realized that to tell the full tale, I needed to write not just from the perspective of the CIA in the West, but also tell the story as it unfolded in the East—which I've done mainly through the voice of Olga Ivinskaya, Pasternak's real-life mistress and inspiration for his character Lara. 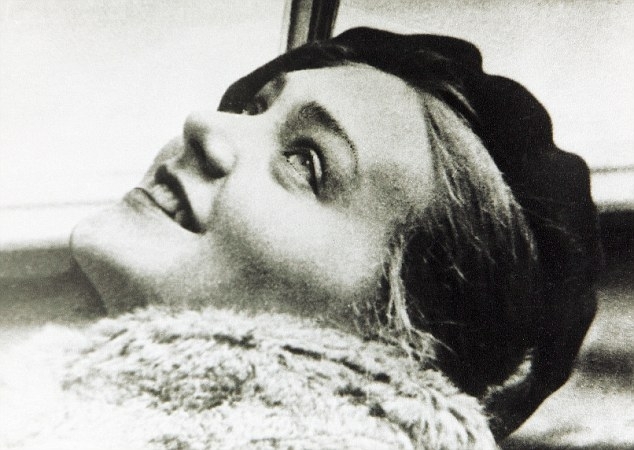 I was fascinated with Olga's harrowing story, and, like Pasternak, she became my muse as well. The result is a polyphonic novel told in alternating perspectives that's driven by strong, female voices, and that—like Zhivago itself—is about war, propaganda, persecution, and, above all else, love. LEARN MORE! Check out this interview with the author by Alfred A. Knopf. I received great pleasure from my research—which kept me invested (read: obsessed) with the story. In the Western thread, most of the characters are fictional. But peppered throughout are historically accurate details—including some real names, as well as direct quotes and descriptions pertaining to the mission. For this thread, The Zhivago Affair by Peter Finn and Petra Couvée proved an indispensable asset. Sergio D'Angelo's self-published memoir, The Pasternak Affair also proved important for the Western thread. As well, the following titles also helped immensely: Legacy of Ashes, The Agency, The Cultural Cold War, The Georgetown Set, The Very Best Men, Hot Books in the Cold War, The Spy and His CIA Brat, The Lavender Scare, Sisterhood of Spies, Finks, Washington Confidential, Expo 58, and Feltrinelli. Throughout the Eastern thread are many direct descriptions and quotes, including excerpts of conversations, as documented in first-hand accounts. Many titles informed the Eastern thread, including, but certainly not limited to: A Captive of Time (Olga Ivinskaya's autobiography), Lara, Inside the Zhivago Storm, Zhivago's Secret Journey, Safe Conduct, Boris Pasternak: The Tragic Years 1930-60, Boris Pasternak: The Poet and His Politics, Boris Pasternak: A Literary Biography, Fear and the Muse Kept Watch, The Nobel Prize, and Inside the Soviet Writers’ Union. and items related to early female spies. I believe there's a power in objects and felt a certain magic when holding these historic items. I surrounded my writing desk with them, hoping some of that magic would rub off. 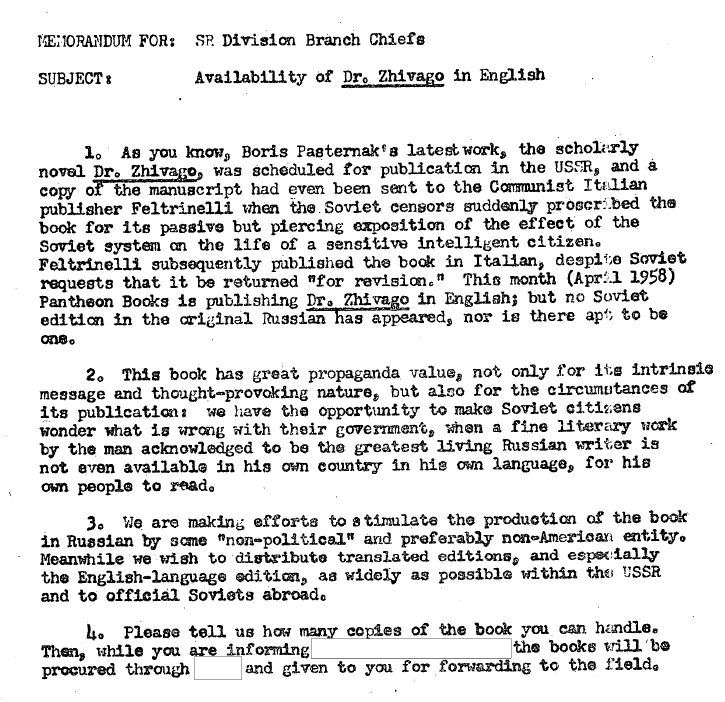 Afters its mission in Brussels, the CIA printed this second, miniature, copy of Zhivago to smuggle into the USSR. The cover features Boris Pasternak's initials in cyrillic. 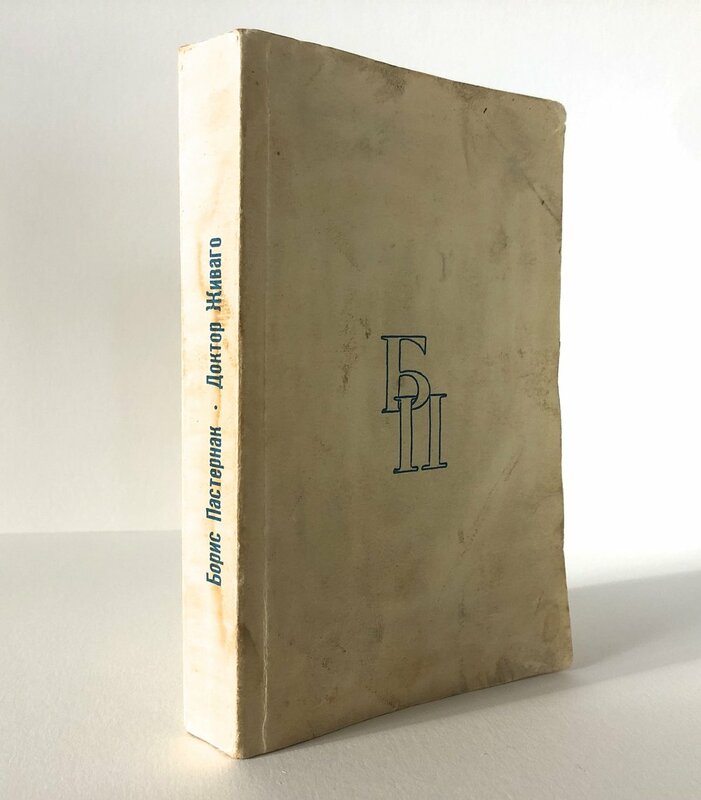 Feltrinelli's first edition, first printing. The book was first published in Italy in 1957. December 15, 1958 edition of TIME featuring Boris Pasternak on the cover -- shortly following the CIA's mission and his Nobel Prize win. Rare 1967 printing from Harvard Library Bulletin. A view into a Gulag labor camp. May 1959 Coronet magazine, featuring an article on Pasternak and Zhivago. Pasternak is on the left and Feltrinelli on the right. Rare pamphlet from the Samizdat movement in Russia — which printed banned materials and distributed them, including Doctor Zhivago. Promotion pamphlet produced by the USSR for Expo 58. Noticeably absent from their map of the fairgrounds were the U.S. and Vatican pavilions. 1950s pamphlet for Milan's Continental Hotel, where Feltrinelli held the book launch party for Dr. Zhivago. Written by Elizabeth Peet McIntosh (aka Elizabeth P. MacDonald, aka Elizabeth P. Heppner) -- one of the first female spies with the OSS/CIA. 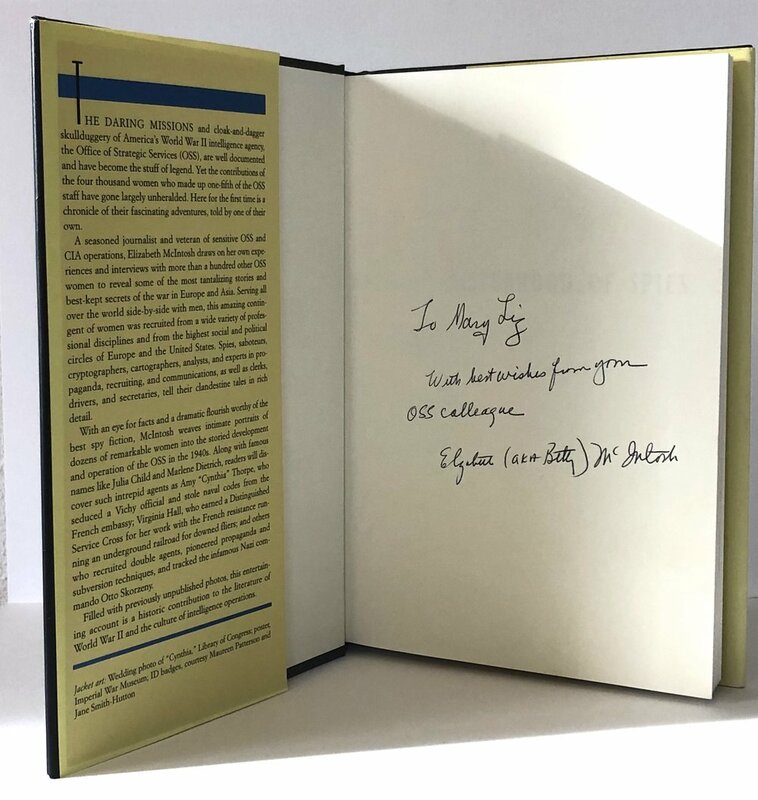 Inscribed by the author "To Mary Liz, With gratitude from your former OSS colleague." 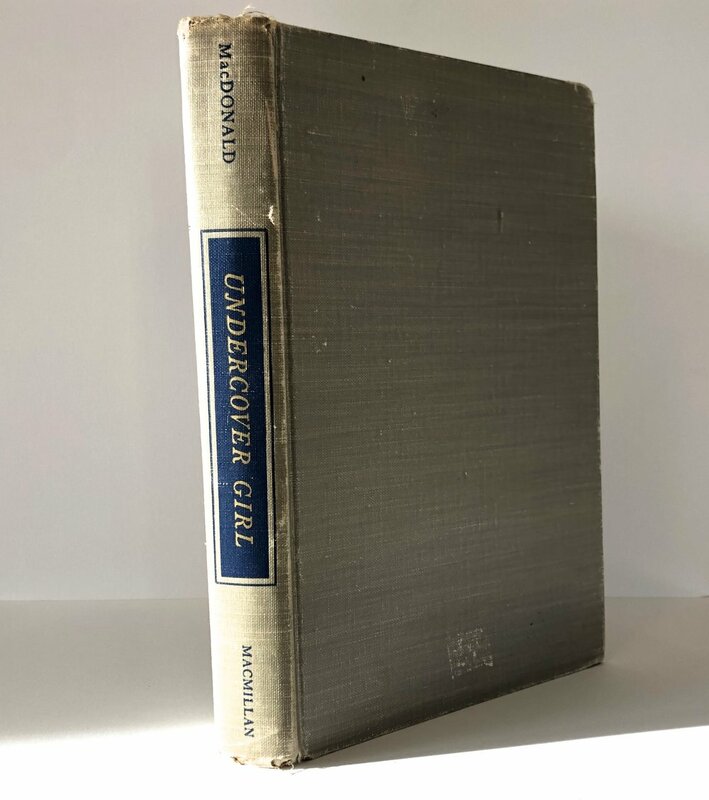 1st edition of the 1947 spy novel written by Elizabeth Heppner (aka MacDonald, aka McIntosh). Author's inscription: to Ruth Paul, a "fellow travellier." 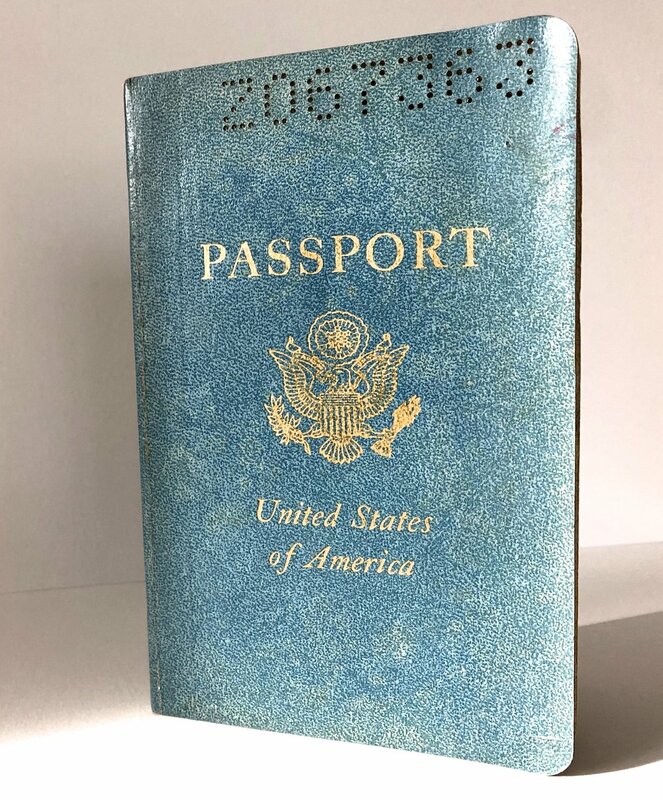 OSS/CIA agent Elizabeth Heppner's actual U.S. passport, acquired from her estate. In Peredelkino, Russia. At the gate of Pasternak's country dacha. Visiting Pasternak's grave in Peredelkino, Russia. Where Olga Ivinskaya first saw Boris Pasternak read his poems. Many early intelligence officers in Washington, D.C. lived in and frequented the Georgetown neighborhood. Dry cleaner in Georgetown, which served as inspiration for part of The Secrets We Kept. Allen Dulles was the first (and longest-serving) CIA Director. Donovan is best remembered as the wartime head of the Office of Strategic Services (OSS), the precursor to the Central Intelligence Agency, during World War II. Frequent meeting spot for early intelligence officers. Inside the Mayflower Hotel in Washington, D.C.
From my visit to meet with Peter Finn, co-author of The Zhivago Affair. Gated entrance to the original OSS and first CIA headquarters. 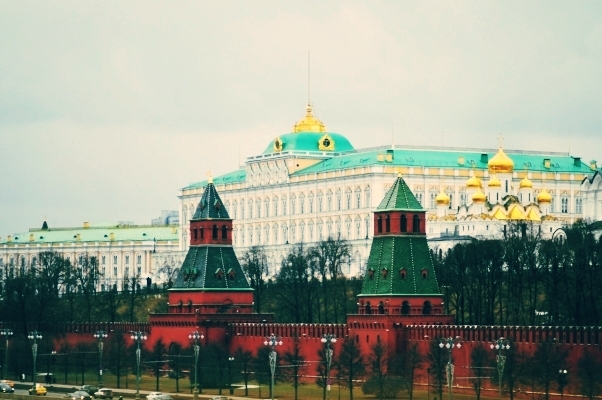 I also visited Russia during spring break of my first year at the Michener Center. (Who ever said Cancun is the ideal spring break locale?) These visits greatly informed the Eastern thread of my novel, especially by providing a sense of place and atmosphere. It was truly a magical moment getting off the train in Peredelkino and walking the same route Pasternak had walked to his dacha on the hill. Visiting his gravesite and its modest tombstone was an incredibly moving experience. The Western thread was informed by my many years spent living and working in D.C. and additional visits to the city for research purposes (including to visit specific locations relevant to the 1950s-era intelligence community). Walking through Georgetown, I felt as if I had a secret to what had happened within the beautiful brick homes, manicured parks, and wood-paneled bars that line its narrow streets. I also visited London and Paris for research and inspiration. Music also played a pivotal role during the writing of my novel. I’m often inspired by music and use it to tap into a certain emotion or place while writing. I usually write listening to the same song, over and over again, until I tune out the words and am left with just the feeling. While composing the Western thread, I listened predominantly to 1950s and 1960s music. I especially listened to R&B, jazz, and soul music popular in Washington, D.C. during that time—artists like Shirley Horn, Duke Ellington, Ruth Brown, and more. I also listened to 50s and 60s-era Italian and French music while writing this thread, including Edith Piaf and Mina. For the Eastern thread, I listened mostly to atmospheric music. This includes contemporary artists like Sufjan Stevens, Philip Glass, and Explosions in the Sky. I also listened to sparse classical music—such as Franz Liszt, Tchaikovsky, and two Ukrainian pianist friends of Boris Pasternak's: Heinrich Neuhaus (who was also the first husband of Pasternak's wife Zinaida), and Sviatoslav Richter (who played at Pasternak's funeral).